As I’ve mentioned before, kitchens and baths are often what sell homes. If you’re getting ready to put a house on the market, spending a little money ahead of time to improve the appearance of these areas can potentially reap you thousands more from a buyer. And for any buyers out there, don’t be immediately turned off by a dated kitchen or bath – reviving these areas can be done easily and cheaply. My Pinterest account is full of great DIY kitchen/bath updates that can be done by just about anyone, but today’s post showcases just how beautifully a DIY kitchen makeover in particular can come out. Enjoy! 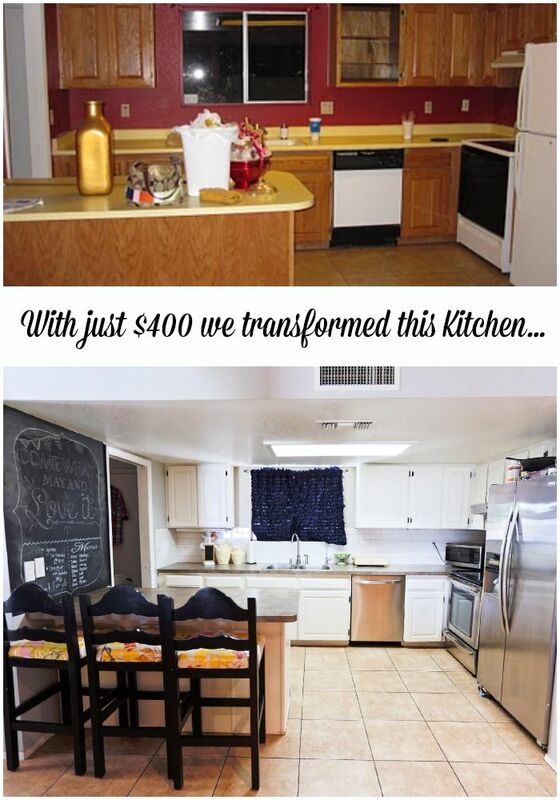 $750 Total Kitchen Remodel – Speaks for itself, but you have to see the before/after! Knocking Down A Wall And Opening Up A Kitchen – This tutorial is one that can come in quite handy – a lot of kitchens are somewhat isolated from the rest of the house, which can be a major turnoff to buyers. Always make sure that structural beams can support the weight of the floors/roof above, and you should be all set! How to Install Concrete Countertops for $200 – I did this with my sink base, which only cost about $50. Love it – and it’s a great way to cover up serviceable but dated laminate counters. Do you have a flame-orange 70’s-era countertop that needs an upgrade? A few coats of this stuff, and it looks fresh and modern! DIY Countertop Revival – If concrete isn’t your thing, this pin offers some great ways to refresh – instead of the time and hassle needed to replace – an old or dated countertop! How To Paint A Faucet – Find a great faucet in the wrong color? Looking for a way to spruce up what you already have? This is a great tutorial to make existing hardware look expensive – and brand-new! How To Update Kitchen Cabinets On A Dime! – This is far and away my most popular pin, but it does require some skill with a miter saw. However, it’s an easy way to create gorgeous kitchen cabinets from what you already have cheaply and effectively! How to Install Kitchen Cabinets – I recommend painting and swapping out hardware if at all possible, but sometimes you need to redo the whole thing. Buying the cabinets from Habitat for Humanity’s ReStore or Craigslist can be done far more cheaply than buying retail, but installation costs can run high, too. If you’re looking to keep costs down for a kitchen remodel, this tutorial is a must-have! DIY Backsplash Decorating Ideas – Backsplashes can be expensive, but these ideas show you how to cut costs with stylish upgrades! 15 Kitchen Mini-Makeover Ideas – Whether you’re trying to maximize your return on the home you’re selling or upgrade the home you have for your own enjoyment, these ideas are fantastic!